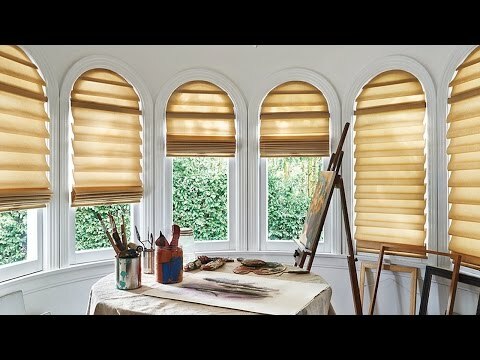 Hunter Douglas’ Alustra® Vignette® Modern Roman Shades, combine the soft elegance of drapery with the function of a shade, to create rooms of extraordinary style and beauty. Alustra Vignette shades are made even more luxurious by the standard fabric-covered headrail and new fabric-covered rotator rail and exclusive 6″ fabric fold. View materials and colours in extraordinary detail. Exquisite Fabrics – Choose the silken sheen of the Veranda fabric for understated glamour with colours inspired by an English garden. Or select the natural texture of the Terrain fabric, a sophisticated look that lends itself to casual decor, adding depth and rich visual elements to any room. Each fabric is offered in six colours and is available with EveScape room darkening for additional light control. Distinguishing Details – An exclusive fabric covered headrail, rotator rail and bottom rail create a thoroughly finished look and conceal the shading when raised. Extend the beauty of both the Terrain and Veranda fabric throughout your room with Accents by the Yard, which provides cut yardage for every Vignette fabric. Exclusive 6-Inch Fabric Fold Size – Alustra Vignette Modern Roman Shades Woven front fabric is attached to rear lining fabric to form soft, billowy 6-Inch fabric folds that mirror the elegance of a custom Roman shade. Compare to the standard three and four inch fold sizes to see the Alustra difference.